Travelling the world on a budget can be challenging and figuring out your accommodation is a big part of your planning. But of course, we all agree that staying at hostels is the best way to save money and have an authentic travel experience, right? You get to know locals and other backpackers with whom you will create amazing memories with. This incredible hostel is located in Santa Marta, the best city to stay in if you want to visit Minca forest and the stunning Tayrona National Park. You will get to enjoy a massive garden with a swimming pool, a basketball court, a pool table, a hostel bar AND… an Italian restaurant! The Dreamer is a very sociable hostel, and if you hang-out in the common areas you will get plenty of opportunities to meet backpackers from all over the world. With so many cool features inside the hostel, it’s going to be hard to want to go out to explore the city, but we are sure your new travel buddies will help you with such a difficult task! Paraty, close to Rio de Janeiro, is an amazing city full of things to explore. Does staying in an old colonial house from the 18 century with a big swimming pool sound like a hostelling dream? Thought so! Casa Viva Paraty really goes beyond for you to have the best experience when visiting the city. They offer horseback riding, stand-up paddle, spa and massages, walking tours and even scuba diving courses. The hostel is also super close to town, very handy to explore everything Paraty has to offer. Flow is a brand new hostel, so you can expect amazing facilities designed to make a backpacker’s life easier. The hostel is in a great location, close to some of Budapest’s main attractions like the Central Market Hall. All dorm beds have a curtain and an individual charger, perfect for you to have some privacy for an incredible price when visiting Budapest. Kokopelli has everything you could ask for in a hostel: located two minutes’ from town, in a beautiful colonial house and is full of social vibes, ideal for getting to know other backpackers. You can also expect a bar with live music (and happy hour! ), pool table, beer pong and foosball. Don’t forget to try their Peruvian culinary classes, BBQs and a restaurant perfect for a budget trip. And yes, you can have all this for less than 10 pounds a night! Berlin truly is an amazing city: full of culture, history, the world’s best clubs and delicious food! Plus Berlin is the perfect place to explore the city on a budget. You will be conveniently located a few minutes’ walk from East Side Gallery between the trendy neighbourhoods of Friedrichshain and Kreuzberg. And there is more! The hostel has a stunning opera bar/restaurant, a swimming pool, a sauna and a perfect courtyard to relax in – if you are visiting during summer. If you are looking for the historical side of Berlin, the hostel’s building used to be a fashion school, it was declared a Berlin Monument and it also has survived two World Wars. The Bananas is the perfect place to chill in when visiting Krabi, in Thailand. You are going to be surrounded by lush green mountains and super friendly staff who will make you feel at home! You can choose between a dorm – perfect for meeting other backpackers, or, if you feel like treating yourself – an amazing bungalow. Spend the day relaxing in the hammocks on the pier and finish the day swimming with the luminous plankton in a truly magic experience. And of course, we have to mention the hostel chef Tscha Dam, who is known for cooking amazing traditional Thai food including fresh seafood, delicious curries and refreshing fruit shakes! We all know that reading other backpackers’ reviews is the best way to understand the hostel vibe. Onederez Hostel is really sociable, with a great swimming pool and a terrace perfect to watch the sunset. The staff will do everything they can to offer you a great experience in Siem Reap. How does spending your day doing a Vietnamese food walking tour, learning how to cook spring rolls and then relaxing in the hostel swimming pool sound? Tribe Ede will offer you an authentic Vietnamese experience in Hoi An, a well-known destination amongst backpackers from all over the world. If you are travelling solo, we are sure you will leave Tribee Ede with a tribe of new friends and incredible stories to tell when you get home. Shoestring Cave House will take your Cappadocia experience to another level. We are talking about a hostel located in traditional Turkish caves, with a rooftop bar, terrace and a swimming pool. The lucky guests can also indulge in a delicious free breakfast and breath-taking views from the terrace! Fact: Stamp hostel is the only hostel in the Caribbean city of Cartagena with a sea view! Located just 10 metres from the beautiful beach, you’ll be falling asleep to the sound of the gentle ocean waves at night. In the day, take a 15 minute walk to the famous walled city and enjoy the sights of the incredible Old Town. The hostel has an amazing pool and a Jacuzzi on the rooftop (see below pic for proof!) There is also a bar and restaurant which provides “INSANE” local food according to a recent review and a great place to socialise and meet new hostel buddies! Have you stayed in an amazing hostel for £10 or less? Tell us in the comments and inspire other backpackers to meet the world! 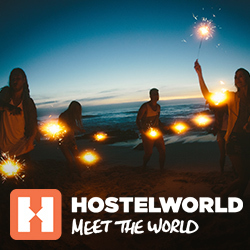 The post Amazing hostels for less than £10 appeared first on Hostelworld Blog.